What type of Aquaponics plants am I able to grow? We have yet to determine what kind of plants do not grow well in an Aquaponics system except maybe for acid-loving plants such as blueberries. We’ve known individuals who are growing strawberries, cantaloupe, papayas and heirloom tomatoes. There were even instances wherein we grew subterranean Aquaponic plants like radishes and beets. You can experiment and see what type of plants work well in your Aquaponics system. Can I use potted seedlings or potted plants that started in dirt? Yes you can. But make sure that you wash off all the dirt and check your Aquaponics plants very closely to look for insects before you add a plant to your system (example: plants that you just bought from the store). Is it okay that I directly sow my seeds into the Aquaponics system? Generally speaking, small seeds of any kind that you would sow directly into the ground can also be sown directly into a media-based Aquaponics system. Examples for these include radishes, carrots and salad greens. We’ve discovered that larger seeds like cucumbers; peas and beans that you sow directly into the soil do not germinate as well. For seeds like these, we suggest you use starter plugs like Rapid Rooter. Can I plant in my system immediately? Yes of course, as a matter of fact you have to plant it immediately so you can establish your Aquaponics plants to ready them to take up nitrates as soon as the cycling is completed and you have already added fish into your Aquaponics system. We strongly suggest you add Maxicrop (Australians call this Season) to your system during the cycling process to provide your plants with a start-up boost of nutrients before you can fully establish your bacteria and the fish waste to serve as their fertilizers. You can learn more about this process by reading the aquaponics cycling article. How many Aquaponic plants can I grow in my system? The number of plants you can grow will rely on the type of plant you want. In general, though you can plant twice as dense in an Aquaponics system compared to a conventional soil-based garden. The reason for this is because Aquaponic plants can already get all that they could ever need at the root zone such as oxygen, water and food so the plants do not need to send its roots looking for these essentials. Your only limiting factor is how much sunlight you are getting for your plant. The end results of these is you get compact and healthy roots as well as lesser competition for water and nutrients below the ground. A word of warning, though, there are companies that sell Aquaponics systems that promise unrealistic expectations of how much food their Aquaponics systems can grow. Before you give in to these promises we suggest you read our blog post to learn more about it. Is it possible to pollinate indoor plants? If so how can this happen? You’ll only have to worry about pollination if you are growing plants for their vegetables and fruits or if you are saving the seeds from your Aquaponic plants. If it so happens that you are going to do either of these two then you need to know what pollination category your plants fall under. What if I detect bugs eating on my plants? First of all we would like to congratulate you for being a keen observer. 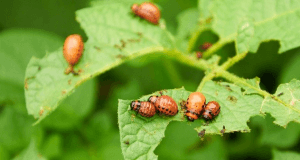 One of the very important rules when managing pest is to regularly look for destructive bugs. Second of all it should be your responsibility to know what type of bugs are there. You can get rid of most bugs most especially aphids by spraying these bugs with a water jet. But if you have small plants then you can simply remove them from your media and allow them to soak in your tank for a minimum of fifteen minutes. This is already enough to drown your bugs and feed your fish. If these techniques don’t work then we strongly suggest you use an organic insecticidal spray or soap. We also advice you to avoid non-organic pest control treatment as well as organic products that contain Pyrethrum and Neem. Both of these are very toxic to your fish. Keep in mind that any spray regardless if they say it’s safe should not be sprayed over fish rafts or over fish tanks.